Since our last update, TC ULA has slowly moved to the south. As of 7am on the 11th of January 2016, it was located south of Vanuatu, and east of New Caledonia. The central pressure of the cyclone was estimated to be 945 hPa, making it a Category 4 cyclone, though it was weakening. It was moving to the south-southwest at approximately 17 km/h. Winds close to the centre of the cyclone were expected to be around 185 km/h. Satellite image showing the location of TC ULA, as of 11am on Monday 11th January. TC ULA is expected to gradually curve southeast today (Monday). It should move south of 25S overnight tonight. Once this happens, responsibility for issuing warnings for this tropical cyclone will transfer from RSMC Nadi in Fiji, to Wellington TCWC (MetService). It is beginning to weaken, and will continue to weaken as it moves southwards over colder waters. This is shown in the forecast track map below. TC ULA is expected to be approximately 500 – 600 kilometres north of Cape Reinga by the end of Tuesday. Once TC ULA leaves the tropics, it will begin to transition from a tropical cyclone, to an extra-tropical low pressure system. Later in the week, when this transition has taken place, there is some uncertainty regarding where Ula will track. It is expected to slow down and remain well north of New Zealand over the next few days. However, the track of Ula is very uncertain from Friday onwards. A range of possible future tracks are shown in the graphic below. Range of possible future tracks for TC ULA (and later, ex-TC ULA) based on UKMO data. Image from NOAA Earth System Research Laboratory. As TC ULA is expected to remain north of New Zealand, the worst of the wind and rain associated with this cyclone is expected to remain offshore. However, humid tropical air moving southwards ahead of the cyclone will bring some rain to northern areas on Tuesday. While this rain may be heavy for one or two areas at times, rainfall accumulations are not expected to be unusually large, and no Severe Weather Warnings or Watches have been issued. 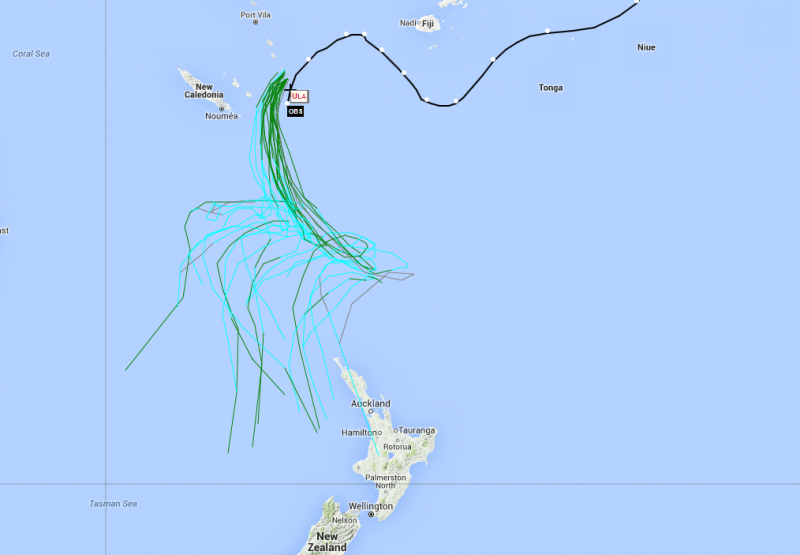 MetService meteorologists will continue to monitor TC ULA as it moves southwards, in case of any changes. 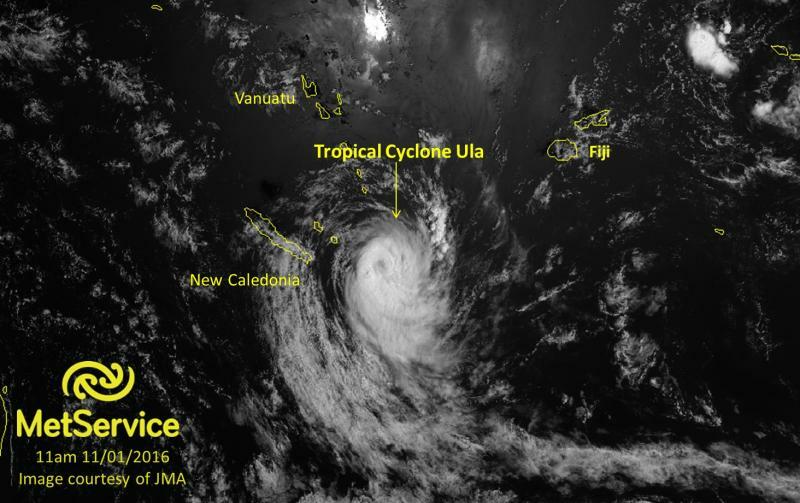 You can keep up to date with TC ULA by looking at our Tropical Cyclone Activity Page where you can see hourly satellite imagery. You can also see our Severe Weather Outlook on metservice.com, and keep an eye on our Severe Weather Watches and Warnings, which will be issued if needed. We will continue to post blog updates on TC ULA as well.